Part of the appeal of visiting Cadenhead's is that you'll never know what they'll have in stock, what's available for tasting or just what you'll leave the shop with. Earlier this month I went into the Edinburgh Cadenhead with an open mind, aiming to leave with 3 bottles but nothing more specific in terms of potential targets. Ok, I'll admit, regulars may know I was very impressed by the Longrow Shiraz at the 2013 Whisky Fringe event, and it had finally arrived in-store, so that might have been at the back of my mind. Yes, I did pick that luscious release, so expect a Taste review next month, it'll be worth the wait believe me. Oooh that dry shiraz finish and tinted colour. On such trips I always ask the staff what they've been enjoying and this Glengarioch bottling from 2010 was produced from the stock room. An unfashionable distillery but one that continues to be a reliable source if under appreciated, hence why it had been overlooked despite being bottled 3 years ago. Cadenhead's do have a couple of maturing casks of this Glengarioch that they have been bottling at different ages, so it is possible to track the development of the malt through time. A couple of the 18 year bottles were by all accounts still in the shop, so one was opened for tasting and hey presto; they've sold out. Yep, mine was the last bottle before it was scrubbed from the definitive chalkboard in the shop. I know I'm stating Glengarioch, but you may see it separated as Glen Garioch. My rule is simple; I just follow what is on the bottle label and Cadenhead's are authentic enough for me. Getting back on track, it is worth mentioning there is a 21 year old of this Glengarioch recently released by Cadenhead's. I haven't tried it myself but from reliable sources I'm told the 18 year is the preferred option. 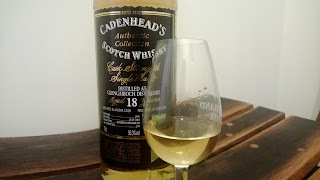 An explanation could be that the cask may have taken over development too much, that was certainly the case with the Cadenhead's 43 year old Glenlivet I tried last month. Still, a tasting experience it was. Douglas Laing have also just bottled a Glen Garioch as part of their new Old Particular range at 21 years apparently it's quite good. Whisky is becoming more expensive, but thanks to independent bottlers you can experience well aged malts without having to break into 3 figures. Ah, but the quality is less you might suggest? Rubbish, if anything it can be a more rewarding experience in tandem with saving your hard earned cash. This bottle is probably nearer to 19 years than it is 18, so without further ado, here's how this release shapes up. Nose: Wet grass, mint, lemon. With a splash of water the aroma of tablet and its sweetness comes through as pineapple and citrus. I'm thinking Wrigley's juicy fruit chewing gum! Mouth: Almond, liquorice, ginger and with water the arrival of marzipan and Birds Eye custard. Verdict: You can enjoy this without water but I a little splash adds a new dimension. Very interesting, certainly a dram I'd serve up to spark some conversation as there is much to debate and could divide the group quite easily.